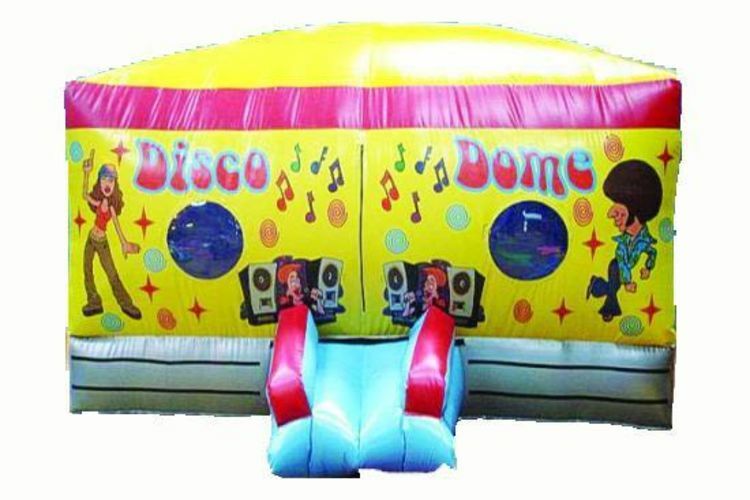 disco dome bouncy castle hire. Here is the disco themed 18f tx18ft dome castle.Its fully inclosed so no matter what the weather you can still have loads of fun .It holds up to 6/10 6 years old in age kids at one time.Also 6/8 adults at one time,Depending on the size of adult.It has great pictures of disco characters on it,Are disco dome has a party time disco dome inside with lights and music from it,the picture is below,with all the details about it.So go and book it on line for your fun day and you will have a great time......We deliver our themed bouncy castles, inflatable slides,rodeo bull hire,plus are assault courses and adult bouncy castles and domes,to Merseyside & Liverpool, Widnes, Runcorn, Wirral,Warrington, and St Helens, and some of these areas and further areas will be a additional fuel charge or toll/tunnel charge.Check our delivery checker on our home page,it will tell you if there is a charge for your area. this below is what is inside are disco dome.so you can read what to do to play your music on it. The Ion Party Time speaker gives you powerful sound alongside colourful dance lights, all in one convenient, portable design. Music can be streamed from any Bluetooth music player or phone, and you can even plug in non-Bluetooth music players using the 1/8-inch input. As your music fills the room, the lights pulsate in time with the beat to create a dazzling effect that provides instant excitement. Party Time makes a great audio-only solution as well-- the lights can be turned on and off at the flip of a switch. Easy to carry and built to last, Party Time energizes an entire room in no time.